One of the most interesting aspects of online betting is that the fierce competition between betting sites is pushing them to offer always new promos to customers. Members have therefore the opportunity to win a lot of money without having to risk nearly anything. BetVictor’s Golden Goal is the latest promotion in that sense which is similar to the Coral Football Jackpot. Golden Goal is available to all BetVictor customers: as long as you have an account with them it is not necessary for you to deposit or bet to take part. All you need to do is opt into the offer and you can do so by visiting the promotions section. You will then need to make a prediction of the score and who will score the first goal in addition to the time the goal is scored in BetVictor’s selected game. The game is normally the Sky Sports feature Sunday premier League late kick-off. If you don’t have an account with BetVictor you should open a new one today and you will also get a free bonus. BetVictor tend to release only a few offers but when they do so they tend to be always very good value and transparent. With this offer, you can win big as if you get your prediction right you will win a minimum of £25,000 in real withdrawable cash. Price will be split if there are multiple winners and it will be rolled over otherwise. If you manage to predict correctly the goal scorer and goal minute but not the correct score you will get £5 free bet each time. The first thing to do is to login into your BetVictor account. If you don’t have one don’t worry as you can create a new one clicking here and you will also benefit from the best welcome offer. After done that login and click on ‘The Golden Goal’ which is in the top menu or alternatively just visit the promotions page. The first step would be for you to opt into the offer and once you have done that you will be able to play the game for free. Normally the Golden Goal game is the one the Sky Sports televised Sunday match however this could change depending on the calendar (ie. Christmas or New Year). Once you have opted into this week’s game you just need to click the play button and you will get transferred to the prediction page. Here you will find three simple boxes where you can pick the first scorer, the time and the score. So everything is pretty straightforward and all you need to do is to select the player you think it will score first in the game from a drop-down list. Here you will also predict if there will be an own goal. Next thing would be for you to select the time the goal will be scored. Again you can do so from the second drop-down menu. As you will be able to see the time is sectioned into minutes, ie. 15:00-15:59. After doing that you need to predict the correct score from the third drop-down list. Please note that once your prediction has been made it cannot be changed so make sure you do it correctly the first time around. 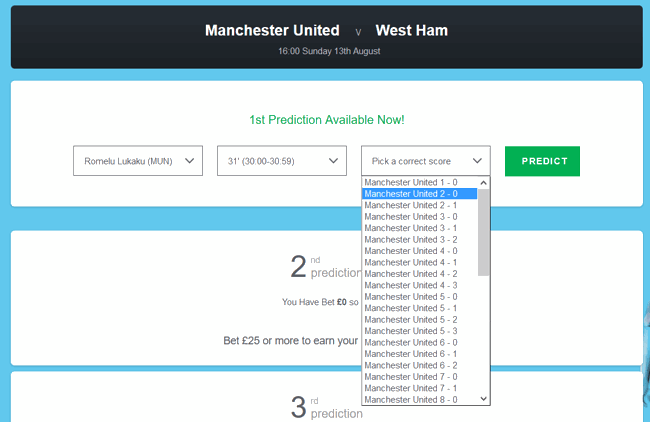 You have a completely free prediction each week however if you bet with BetVictor you also have two further predictions. So if you bet on BetVictor for £25 or more in either the sportsbook or the casino you will get a second prediction. There are no minimum odds or restricted markets or games so you can decide freely how to invest this cash. If you then wager a further £25 on any sports markets or casino you will be given a third prediction. Another thing to note is that it doesn’t have to be a single bet as it is cumulative and it can also be a combination of both sports and casino bets. You can look at your progress towards earning a prediction in the golden goal tab ‘ You have Bet £X so far’ so everything is very transparent. Golden Goal can be played via desktop or any mobile devices and tablet. If you are playing from outside the UK or have your account in a different currency than GBP you will need to bet the relative amount that again will be shown in the Golden Goal tab in order to gain the 2nd and/or 3rd prediction. So it is all about the Man, the Minute and the Match! You can make your predictions up until the kick off of the match and after that, you just need to sit down and enjoy the game hoping for the best. If the stars are with you then you can win the whole prize pool or you will have to share with a fellow player that has also had the same intuition. Whoever will get the prediction correct will win or share the prize pool. In case nobody will win the money rolls over to the following week. Every week £25,000 will be added to the prize fund so this means that you have at least £25k guaranteed. If there is no winner than the price will increase in multiples of £25,000 until someone will finally win. BetVictor do also increase the price pot around special weeks: for example, in the first week of the season or on Christmas the price pot is normally stretched to £100,000. Over the season BetVictor give away £1,000,000 to their customers with this promotion. If you do win then the money will be credited into your account in just a few days and you can do what you like with them. BetVictor has been named the ‘Gentlemen’s Bookmaker’ as they are very honest and transparent. What you see is what you get so you can also withdraw all the winnings in one go if you wish so. Another thing to note is that if you manage to pick the first goalscorer and the goal time you will be given a £5 free bet each time as a compensation. As always there are quite a few terms around this offer but most of them are about the abuse of promotion and defining terminologies. There are very few terms and conditions about the game itself as everything is pretty straightforward: if you are over 18 and live in a qualifying country than you can play. There is a full copy of all terms and conditions on the BetVictor website. This is a great offer from one of our favourite betting sites. BetVictor are making every week people happy with this completely free game. It only takes 20 seconds to give out your predictions so why not giving your luck a chance without any risks?